Home » Uncategorized » What’s in the Secret Sauce that Makes Exhibitions Resilient? What’s in the Secret Sauce that Makes Exhibitions Resilient? 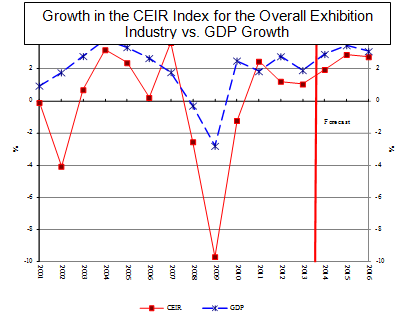 This week the new edition of the CEIR Index was released. Results reveal that the business-to-business exhibitions channel continues to grow incrementally, in parallel with slow growth of the U.S. economy. And growth in the near-term future is anticipated to accelerate. The Index has tracked the performance of the channel since 2000. In looking at the peaks and troughs of the industry, there is a parallel relationship between the exhibition channel performance and US GDP, as shown in the chart below. History reveals the exhibition channel weathers each economic storm, it recovers when the clouds clear. So what makes the channel resilient, what’s the secret sauce? Two white papers offer insights on what keeps exhibitors and attendees coming back. The ‘secret sauce’ is delivering the right mix of content and people for both exhibitors and attendees so they achieve their objectives for investing their organization’s money and their time to be there, basically, delivering ROI. For exhibitors, this means delivering the right mix of the brand marketer’s target audience to the exhibition that enables the company to meet multiple marketing and sales objectives with both existing and prospective clients. It is always first and foremost about the quality of attendance. For attendees, this means delivering the right mix of offerings that enable an attendee to achieve multiple shopping and learning objectives. First and foremost, shopping is the primary focus, including interest in in seeing new product technology, interacting with new products and having a chance to interact with the people behind the products. They also aim to achieve multiple learning objectives, both in accessing learning opportunities made available by an event or in an exhibitor’s booth, but also from their peers through networking. Exhibitions that are known to deliver the industry ‘under one roof’ offer the most compelling value proposition. To obtain specific insights, take a minute to download the white papers above. 1 Comment on What’s in the Secret Sauce that Makes Exhibitions Resilient? This is an excellent blog! I’m always asked to show the value of F2F, and this pulls together that argument well. Good job!